DDSY666 single phase split DIN-rail prepayment meter is the control unit which can be used in one phase two wire or one phase three wire power network. It complies with STS standard and communicates with the CIU/UIU by MBUS for energy consumption monitoring and credit charging. CIU666K-M customer interface unit is the credit charging unit with keypad. It communicates with meters or control units by MBUS for energy consumption and credit balance monitoring, credit limitation alarming and credit charging. ◆ STS standard protocol ensures an open and secure prepayment system, the numeric token is transferred into the meter via the local CIU/UIU with MBUS. ◆ Internal switch relay for load control by configuring. ◆ Prepayment and postpaid mode switchable according to customers’ requirement. ◆ Unidirectional or Bi-directional energy measurement, including active forward and reverse energy measurement, Instantaneous value measurement. ◆ Inquired by CIU/UIU for instant information/present energy/historical energy. ◆ Event log function including multiple event detections/emergency credit/overload log. ◆ Easy to operate by 3x4 number and function keypad. ◆ Easy to match, convenient for site installation. DDSY666 single phase split DIN-rail prepayment meter is the control unit which can be used in one phase two wire or one phase three wire power network. It complies with STS standard and communicates with the CIU/UIU by PLC or RF for energy consumption monitoring and credit charging. 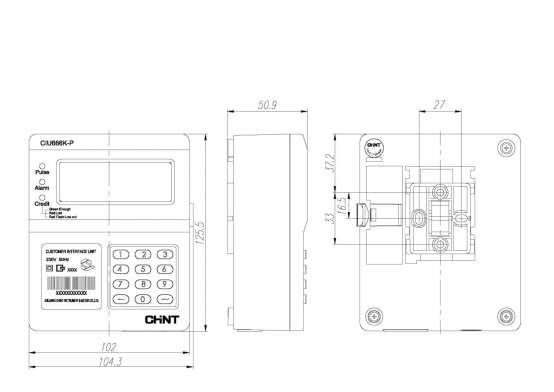 CIU666K-P customer interface unit is the credit charging unit with keypad. It communicates with meters or control units by PLC or RF for energy consumption and credit balance monitoring, credit limitation alarming and credit charging. ● STS standard protocol ensures an open and secure prepayment system, the numeric token is transferred intothe meter via the local CIU/UIU with PLC or RF. ● Internal switch relay for load control by configuring. ● Prepayment and postpaid mode switchable according to customers’ requirement. ● Inquired by CIU/UIU for instant information/present energy/historical energy. ● Event log function including multiple event detections/emergency credit/overload log. ● Easy to operate by 3x4 number and function keypad. ● Easy to match, convenient for site installation. ● Easy to replace the Battery, without uninstalling. ● LCD backlight can increase readability under low light condition.